THE WRITING BUDDHA - Opinions | Books | Movies: Manhattan Malhotras by K.N. Mystique (Book Review-4.25*/5) !!! Manhattan Malhotras by K.N. Mystique (Book Review-4.25*/5) !!! 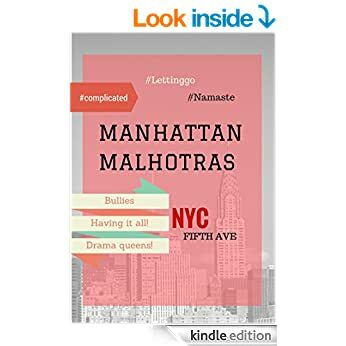 I am just done reading another e-book of this year- Manhattan Malhotras written by K. N. Mystique. The book is released only in the digital format so you won't be able to purchase it's paperback version though it deserves to be put across the shelves in all the bookstores of India. As a debutante, Mystique have definitely impressed his readers with the kind of story he have chosen to tell in his first book itself. Though the book's basic characters are those who are almost in their teenage but still the kind of situations, scenarios and conditions they are facing makes this book a worthy read even for the good grown-up adults. And I would also recommend this book to the parents specifically. The author should be surely complimented of beautifully weaving the magic in this book which very carefully talks about the various problems that a teenager has to face because of their parents unintentionally. Mystique's writing style is very simple and the sentence formations are also very short and crisp. Any beginner would love this book as his first because of the simplicity with which the author tells his story. To keep the story short, author have not described the conversations with the expressions of the characters and have directly mentioned the sentences only. Initially, I felt that it's a bad idea but later on, I found it deserving because over-description would have only added pages to the book rather than anything potential which would have improved the story line. The best part of the books have been its characters- I do not have words to tell how amazingly author have portrayed that you find yourself attached with each one of them. The extremely good work is done with the main characters- Neha, Naisha, Tara, Raynaa, Aarav, Rohan etc. Because of the characterization, this book is whatever it is because a book becomes memorable only with good characters otherwise it's just another story to read and forget. The climax is little filmy as everything starts settling down for each one of them but still, it makes the whole odyssey of reading this book much better. Coming to the drawbacks, the first one that I would like to point out is the alignment. The whole book is published without proper justification which makes the whole experience of reading little irritable. Coming to the story, I wished if author could have started the book little better than it is so that the effect could have been felt right from the first page itself because the story starts getting better only after 30-50 pages. Rest, it's a book which is worth reading and I give it 4.25* out of 5. GO FOR IT! Why are we so Religiously Intolerant? My 26th Birthday! The Most Pleasant One Ever!